Body frame size is determined by a person's wrist circumference in relation to his height. For example, a man whose height is over 5' 5" and wrist is 6" would fall into the small-boned category. 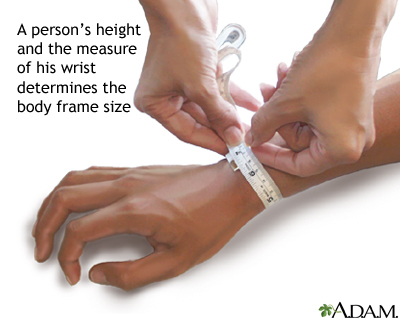 Determining frame size: To determine the body frame size, measure the wrist with a tape measure and use the following chart to determine whether the person is small, medium, or large boned. Small = wrist size less than 5.5"
Medium = wrist size 5.5" to 5.75"
Large = wrist size over 5.75"
Height 5'2" to 5' 5"
Small = wrist size less than 6"
Medium = wrist size 6" to 6.25"
Large = wrist size over 6.25"
Small = wrist size less than 6.25"
Medium = wrist size 6.25" to 6.5"
Large = wrist size over 6.5"
Small = wrist size 5.5" to 6.5"
Medium = wrist size 6.5" to 7.5"
Large = wrist size over 7.5"